A calm protected site teeming with a wide variety of tropical fishes and Invertebrates. A beautiful wall dive leads to the famous Sandfalls. These look like waterfalls but are composed entirely of sand. Rocky slopes are covered with gorgonians and graceful sea fans. 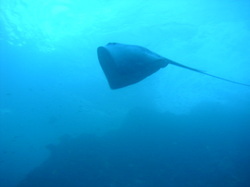 It is not unusual to spot manta rays (in the summer) and big fishes. This is also an excellent night dive and snorkeling area. Pelican Rock is a must for all underwater photographers and videographers! This dive site starts in a shallow sandy bottom that slopes off into deeper water with rock boulders appearing at around a depth of 40 ft. At a depth of 90 ft. a cliff face starts and continues east until it connects with the sandfalls. Great spot for moray ells and barracudas schools. A calm protected site perfect for begginers. It is a wall that drop from 70 ft on down with great submarine canyon. There are many kind of sea fans on the wall and many eels in the crevices. Sometimes there are tunas, bonitos, schooling of pigmy mantas and groupers patrolling the wall. An interesting area consisting of rocky substrate covered with Hard and Soft Corals, Sea Fans, Sponges and Gorgonians. Another Sandfall occurs here and Tropical abound. 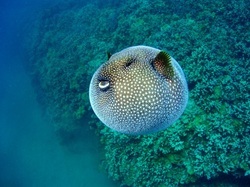 At times large fish, several kinds of rays (Eagle ray, Stingrays, Pacific giant Mantas) and Turtles, may visit this area. 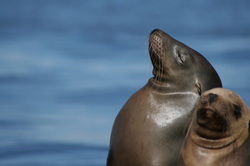 Located at the point of the Baja Peninsula where the Pacific Ocean joins the Sea of Cortez, sea lions, morays and huge sea bass are common denizens of this unique site. Marauding groups of game fish are brought in by large schools of baitfish such as sardines and green jacks. Just past the final pinnacle lies a shipwreck that forms a natural aquarium for scuba divers and sea lions to play in! This wall is a vertical drop-off from 75 - 500+ feet. The average depth for this dive is 100 feet. Diving next to the wall without seeing the bottom gives you a sensational feeling of freedom. The rocky cliff face continues to the west until it connects with the sandfalls at Pelican Rock. Enormous groupers and large schools of mantas as well as barracuda schools can be seen here. Divemaster, scuba tank, weights, bottle of water and National Park fee included. A breath-taking bay known for its diving and snorkeling. This is a beautiful, protected finger reef that starts right at the shores of Chileno Beach and extend out into the bay for about a half of a mile, covered with coral, it is home to a large variety of schooling Tropical Fish, Sea Turtles and several species of Moray Eels. A colorful collection of invertabrates, starfish, seafans, sea urchins and sponges fill the nooks, crannies and sea floor. One of the region’s prettiest beaches; here you find yourself in a calm little bay teeming with a huge variety of tropical fish surround the graceful sea fans on this protected cove. A beautiful, tranquil spot for diving, snorkeling and photography. Massive boulders, rugged tunnels and deep rock-cuts form the backdrop of this spectacular and exciting dive. Manta Rays, Sea Turtles, schools of Jacks and Grouper are common inhabitants here. Magnificent marine life abounds within the many grottos and shallow caverns formed by the coral and rock of the Blow-Hole! This shallow dive site starts in only 5 feet and ends in a sandy bottom at 50 feet. Thecoral growth is superb and unmatched in this region. 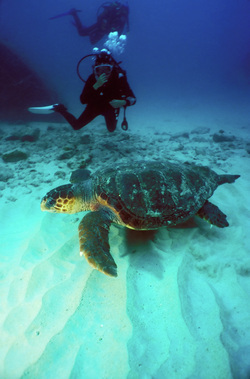 This spot is also known to be home to sea turtles, octopus, moray eels and nurse sharks. Large schools of porf fish and snappers are sometimes seen on the sandy bottom next to the reef. Divemaster, scuba tank, weights, bottle of water included. Adjacent to The Hotel Palmilla, lies a pristine beach along a protected, tranquil cove that is perfect for diving and snorkeling; covered with coral, it is home to a large variety of schooling Tropical Fish, Moray Eels. 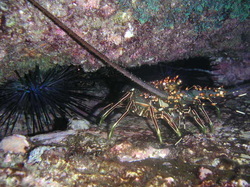 A colorful collection of invertabrates, starfish, seafans, sea urchins and sponges fill the nooks, crannies and sea floor. Located close of San Jose del Cabo. There lie the remains of a Japanese fishing boat that ran around in 1964. The wreck is a short boat ride away from Puerto Los Cabos. It is in 3 parts. The prop is big and the hull is upturned. If you're used to wreck diving you can take a torch and swim inside (with the safety procedures). The hull sparkled and was covered in fan worms with little fish peeping out of holes.. The wreck can be host to literally hundred of fish of numerous species making it very good for photography. It is a very good second dive to do after Gorda Banks.